- Suzy in Nazi Germany – Featurette on the German locations from SUSPIRIA. 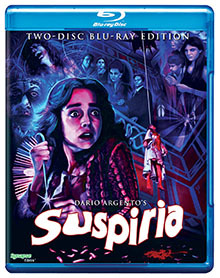 - A Sigh from the Depths: 40 Years of SUSPIRIA – All-new anniversary retrospective on the making of the film and its influence on cinema. - Olga’s Story – Interview with star Barbara Magnolfi. - “International Classics” English “Breathing Letters” opening credit sequence from U.S. release.